It's a pretty exciting time in Red Sox Nation. The Sox are winners of nine straight games and turned a tightly compacted AL East-race into an all-out assault on the rest of the division in the span of a little over a week. With their record currently sitting at 90-64, it seems as if it's a foregone conclusion that they'll make the playoffs and won't have to stress the last week of the season with whether or not they'll slide into one of the two Wild Card spots. 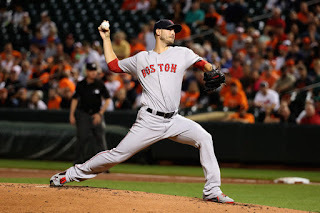 But it's hard to talk about the Red Sox's success this year without mentioning Rick Porcello. To us, Porcello has had an incredible season full of consistency, intensity, and winning. However, he hasn't been getting enough attention around the league especially with regard to winning the Cy Young Award -- an award he should be receiving at year's end. He should be the winner. His numbers are outstanding. 21 wins pegs him with the most wins in the American League. His 3.08 ERA is the third best in the AL. His last 11 starts have been 7.0+ innings. His last 16 starts have been 6.0+ innings. There has only been one pitcher as consistent as Porcello all year, and that's Britton. Britton has had one of the best years a closer has had in the history of baseball. Both him and Porcello have been just as consistent. The voters for this award should come down to these two and should lean in favor of the starting pitcher, cough cough Porcello. But in reality, the voters probably won't even come down to these two and may not even mention Porcello's name. They will most definitely lean towards bigger names such as Cole Hamels, Sale, and even Kluber. It's alright Pretty Ricky. We believe you should win the Cy Young. Follow Evan Marinofsky on Twitter @emarinofsky for all of his latest Red Sox takes!